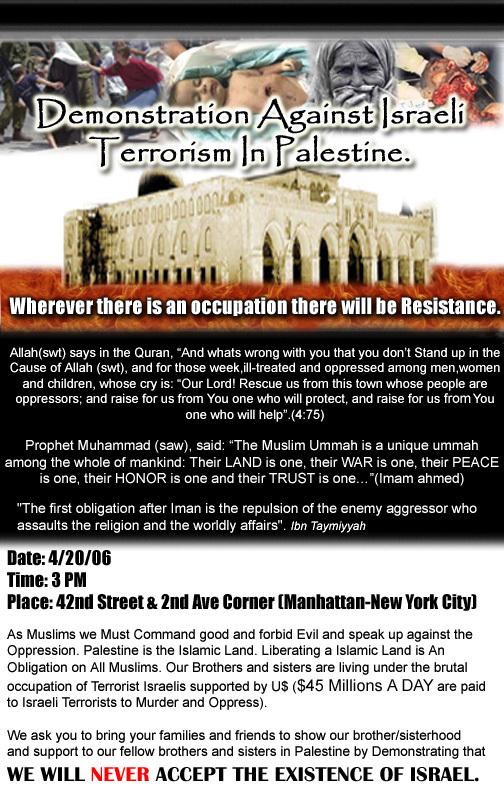 Islamists' message to Israel at New York City rally: "The mushroom cloud is on its way!" Leader (in Arabic): With our blood and our lives we will liberate al Aqsa! [The rest also respond in Arabic:] With our blood and our lives we will liberate al Aqsa! Israeli Zionists, What do you say? How many women have you raped today? How many children have you killed today? They get paid by the Israeli and the US government to do their job. No wonder they call you sons of apes and pigs because that's what you are. So we say the hell with you! Homeland Security burn in hell!! The Islamic Thinkers Society is an offshoot, at least ideologically, of London's Al-Muhajiroun, a group that celebrated the 9/11 attacks, referring to the hijackers as "the Magnificent 19," and posting a burning picture of the Capitol on its website. "We, the Muslims of Islamic Thinkers Society condemn the arrests of the sincere Muslim Da'ees (activists) in UK. We condemn the house raids of Sheikh Omar Bakri Muhammad, Anjem Choudary (Ex-Leader of Al-Muhajiroun UK), Abdel Rahman Saleem (Muslim Youth Organisation), Umran Javed (Followers of Ahl Us Sunnah Wal Jama'ah), Abdul Muhid (Al-Ghurabaa), and Omar Zaheer (Muslims in the UK). The raids, which violated the honor of the women of the household when the police entered at 2am is something we will not tolerate and stay silent about."